When a dog or cat comes into the clinic with injuries caused by blunt-force trauma, it probably was hit by a car. Or was it? Veterinarians generally rely on their instincts to tell the difference between an accident and abuse. But eliminating some of the guesswork in suspected cases of cruelty or neglect could help get animals out of violent households and produce evidence to prosecute their abusers. Nida Intarapanich, a third-year veterinary student at Cummings School, took up that cause, one at the forefront of the emerging field of veterinary forensic science. She has developed a statistical modeling tool that looks at injury patterns to help veterinarians distinguish between accident and intent. And because an abused animal often signals more widespread violence in a household, her work could help human victims, too. The Humane Society of the United States estimates that nearly one million animals a year are abused or killed in episodes of domestic violence. In 2013, the Animal Rescue League of Boston helped investigate 420 criminal cases of animal cruelty or neglect. 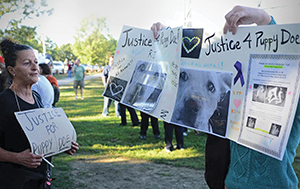 The Massachusetts Society for the Prevention of Cruelty to Animals investigated 2,089 suspected cases of animal maltreatment in 2012, according to its most recent data. Injuries from car accidents and abuse manifest in very different patterns, says Intarapanich, who examined the medical records of 400 dogs and cats hit by cars and treated at Cummings School’s Foster Hospital for Small Animals. She also looked at 50 confirmed cases of abused dogs and cats from the American Society for the Prevention of Cruelty to Animals. Her work, done with faculty mentors Elizabeth Rozanski, an emergency and critical care vet, and Emily McCobb, V00, M.S.03, director of the Shelter Medicine Program, was funded by the school’s student research program. Abused animals, Intarapanich discovered, tend to have a much higher rate of head injuries and rib fractures. They also sustain tooth fractures and claw damage. “Many veterinarians associate claw damage with a pet skidding across the pavement after being struck by a car,” Intarapanich says. “But our research showed it’s far more significantly associated with physical abuse.” The researchers suspect an animal injures its claws “in a frantic attempt to escape the actions of the abuser,” she says. In contrast, pets hit by cars tended to suffer skin abrasions and damage to the hind end, likely from being hit while running away from the vehicle. Similar to patterns of injury seen in child abuse, evidence of previous fractures is often present in animals that have been intentionally hurt. “Unfortunately, physical abuse rarely is a one-time occurrence,” says Intarapanich, who plans to submit her research to a veterinary journal or human forensics publication. These new findings about abuse injuries would be hugely important for prosecuting animal abusers, because “oftentimes we are trying to refute an unlikely story,” says Martha Smith-Blackmore, V97, a veterinary forensic scientist. Smith-Blackmore, vice president of animal welfare at the Animal Rescue League of Boston, often testifies in court about animal abuse. “Many times a veterinarian may have a gut feeling that this just isn’t what an animal looks like after it was hit by a car. Until now, there hasn’t been a scientific study of cases that says when animals get hit by cars, these are the collection of injuries we tend to see,” she says. Once she had cataloged the abuse and accidental injuries, Intarapanich applied a statistical method called discriminant analysis, allowing her to develop an equation that can be applied to identify car-strike victims with 92 percent accuracy and abuse victims with 81 percent accuracy. The connections between animal abuse and other interpersonal violence—including violence against spouses, children, elders and the mentally and physically challenged—are well-documented. “It’s been conventional wisdom in Western philosophy for hundreds of years that children who hurt animals in young childhood often grow up to have aggressive and antisocial behaviors in adulthood,” says Phil Arkow, coordinator of the National Link Coalition, which works to end violence against animals and people and curates research on the connections between the two. However, only recently has there been a body of research that shows that “acts of animal cruelty often indicate the co-occurrence of other crimes or predict future crimes,” he says. It’s not just social services and animal welfare experts who have made the connection between human and animal violence. The FBI announced in October that it will begin tracking data on cases of animal cruelty the same way it does for homicides, arson, armed robberies and assaults—through its enormous electronic database known as the National Crime Information Center. Arkow calls the move “probably the most significant sea change in the history of animal protection.” Now some 18,000 U.S. law-enforcement agencies will report arrests for intentional abuse or torture, organized abuse (dogfighting and cockfighting), gross neglect and sexual abuse of animals. “This sends a signal to every police officer and sheriff in this country that animal cruelty is indeed a crime to be taken very seriously,” Arkow says. The crime center data will allow communities and law enforcement to gain a better understanding of animal abuse and its perpetrators. That, Arkow says, could produce more effective programs to prevent such violence. Currently, there are certain animal cruelty crimes that can be prosecuted as felonies in all 50 states, according to the Animal Legal Defense Fund. Before 1986, just four states had felony-level animal cruelty laws. Additionally, “more and more states are mandating veterinarians to report [to police] suspected animal cruelty or permitting them to do so without fear of civil or criminal liability,” Arkow notes. When children mistreat animals, it may indicate that the youngsters are victims of abuse. In a 1983 study of New Jersey families investigated for child abuse and neglect, children had abused pets in one-third of the homes—using the animals as scapegoats for their anger. A 2003 study found that sexually abused children were five times more likely to have abused pets than children who had not been molested. Young people who perpetrate or witness animal cruelty are more likely to commit other violent acts. 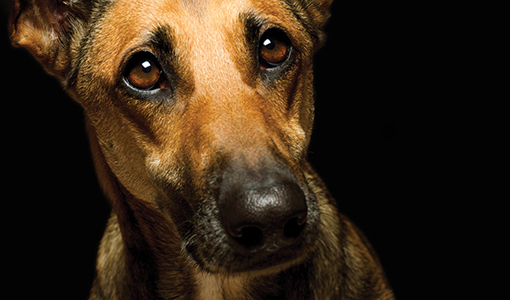 A 2013 study showed that 43 percent of schoolyard shooters have histories of animal cruelty. A history of pet abuse is one of the four most significant risk factors for becoming a batterer. Seventy-one percent of battered women report that abusers hurt, killed or threatened their pets to control them and their children. A dozen studies reported that between 15 and 48 percent of battered women delay leaving abusive situations—or return to them—because they fear for the safety of their pets. One study reported that 41 percent of domestic-violence batterers had adult histories of animal abuse, compared with 1.5 percent of the general population. If you know of or suspect animal cruelty, it is recommended that you contact police or your local animal control officer.